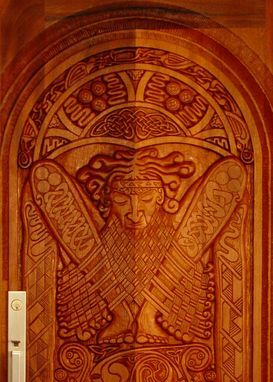 This door was created to showcase the oversized carved triskele spiral grouping at its center, inspired by The Book of Durrow. 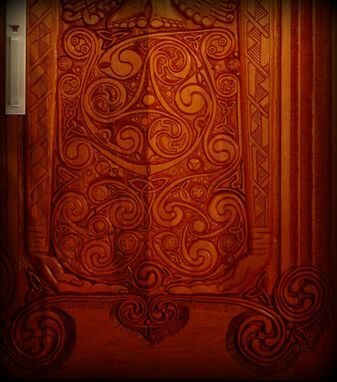 The rich mahogany holds these spiraling Celtic designs in a lighthearted yet fashionable form, lending an inviting welcome to mountain guests as they arrive. The homeowners wanted an entrance that was beautiful yet approachable and playful for the eye, as well as an element that ties into the rock adorning their home and the surrounding mountains. 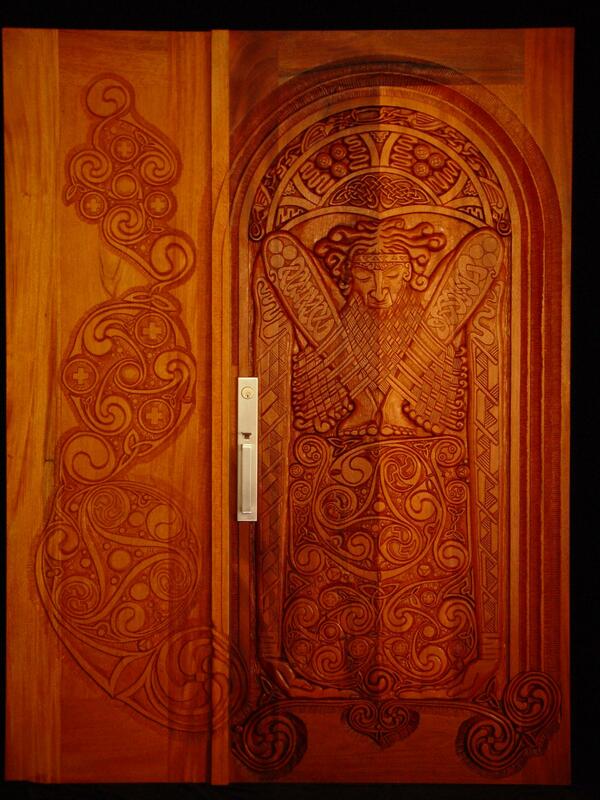 Renfree Carving Studio is influenced by countless individuals and cultures, but one of his most versed art forms is the Druid art of patterns and knot works. Drawing from ancient books created by the Druids, Raleigh is able to recreate beautiful designs that have deep-seeded meaning to the ancient people of Europe; The Book of Kells and The Book of Durrow are both fantastic examples. The use of triskele spirals within larger designs, as well as singular, was very popular in Celtic culture. A great example of a larger design made up of multiple triskeles can be viewed on page 29. In this design a man with a woven beard crouches in garb decorated with endless knots and key patterns as he collects a spiraling universe made up of triskele spiral groups. 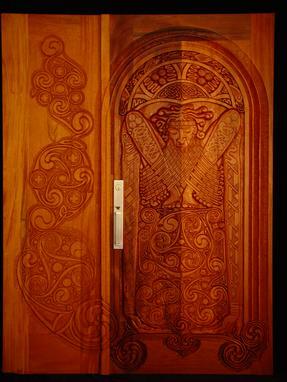 The Triskele Spiral door makes use of these beautiful designs, accentuated by the rich woods and fractured moss rock.